When I checked the thermometer at five o’clock this morning it was already 70°, so I figured I’d better get up and decide what to do before it got too hot. The main advantage of going for an early run is that it’s cooler, at least at the start. Another benefit is that if I run when the sun is still low in the sky, the shadows are longer. There’s a big difference between running in the shade and running out in the direct sun, even when it’s only 70°. Waiting until evening to run was an option. Knowing that it will cool off during the course of a run makes it easier to keep going. But it was supposed to be hot and sunny again today, and the thunderstorms in the forecast weren’t supposed to make much of a dent in the heat or the humidity, so I got dressed and went out for my run. By the time I finished my 12 mile run it was up around 80°, so the extra shade was a blessing. Another benefit of going out early is that bunny days are much more likely. Today was a double-bunny day, courtesy of the garden in the backyard down the street. I was a little tired Thursday and Friday, but after taking yesterday off to work at the Blackburn, today’s run went well, especially when I took the weather into consideration. It’s taken time, but I’m getting acclimated to summer. My body adjusts by thinning out my sweat to retaining more minerals. The drops running down my face still taste soupy, but at least I’m not all crusty with dried salt after I finish my run. Even without running, yesterday was a full day. Ruth and I got up early to drive to Gloucester for breakfast. We tried the Crab Benedict at Sugar Magnolias and found it worthy. Then we wandered over to Pavilion Beach, site of the finish line for the Blackburn Challenge. Ruth spent the day out in Gloucester Harbor on the timing boat taking pictures of the racers as they passed the Greasy Pole, while I stayed on shore to help enter the results into the computer, shuttle people and food out to the timing boat via canoe, haul garbage cans around, and do whatever else was needed. After the race was over, we went to Donna and Dave Lind’s house to relax and enjoy a post-race dinner. Donna used to be the race director for the Blackburn, and she still does a lot of the work that makes the race happen. Dave helps with the work, but on race day he’s often part of the flotilla circling Cape Ann. 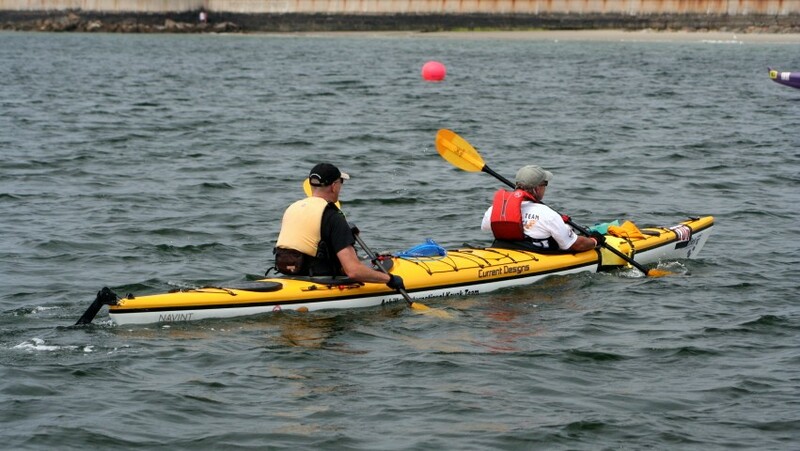 This year he entered in a tandem kayak with a paddler from the Achilles International kayak program. Achilles International is a charity that works “to bring hope, inspiration and the joys of achievement to all people with disabilities” by pairing them with able-bodied partners to compete in athletic events. I was familiar with them from their running program, so I was interested to learn that they also had a program for paddlers. Dave’s partner was Dennis Moran, who was left with impaired motor skills after an operation to remove a brain tumor. Dave really enjoyed the experience of working with Dennis, and they went home with medals after finishing third in their division. After dinner, Dave agreed to join me and my friend Mark to make up a team for the Josh Billings Runaground in September. The Josh is a bike-paddle-run triathlon held out in western Massachusetts in the beautiful countryside near Tanglewood, the summer home of the Boston Symphony Orchestra. so I decided to go back this year with some friends. Dave is a yoga instructor and Tanglewood is right next to the Kripalu Center, so he’s going to double up and spend some time at the center before the race on Sunday. I had fun doing the paddle leg last year as part of a pickup team, and it was great to finish a race without tired legs, but this year Mark will pedal the 27-mile bike leg, Dave will paddle 5 miles in the Stockbridge Bowl, and then I’ll run the anchor leg to the post-race party at Tanglewood. ← CCM: Summer Fun in the Sun?